2013 in the Jones household ended in a spectacularly non-wild fashion – the four of us at home, with very few hours sleep but limited alcohol intake and BBC Scotland on the TV showing back to back fiddle / accordion music and ceilidh action to cries of delight from the other half (“Look! They’re doing Dashing White Sergeant! Again!”). C, predictably, slept pretty much through the whole thing, other than waking to feed every couple of hours. We thought G was pretty easy going as a baby, but C seems to have taken it to a new level. Her big sister, usually a deep sleeper, was woken up by the fireworks outside at midnight and then refused to go back to bed until the early hours of the morning, I guess on that basis the whole affair was still one step up from going to bed early and sleeping through the bells. Thinking it was the fireworks on the TV that woke her up, G’s put in a request that we watch something quieter tonight, like Peppa Pig perhaps. The reality is that they’re both too young to really understand the concept of New Year – without the promise/threat of Santa and presents, or party guests in the house, there’s really not a huge amount to entice a 4 year old to get excited about the whole event. But with them being half Scottish courtesy of Daddy – virtually a professional Hogmanay celebrator – I’m pretty sure they’ll both make up for this in years to come. If nothing else, I can rest assured that unlike me they will know the words to more than one verse of Auld Lang Syne (yes, there’s more than one), and will spend disproportionate amounts of energy telling people off for linking hands too early. 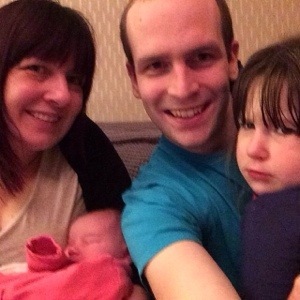 This year, we had to be content with an inevitable full family ‘selfie’ at just after midnight, which we later realised was the first ever picture of all four of us together. I’ve learnt not to do New Years resolutions (they get forgotten within a week anyway), but suffice to say that even without a decent night’s sleep behind us, 2014 is looking as though it’ll be a pretty good year.